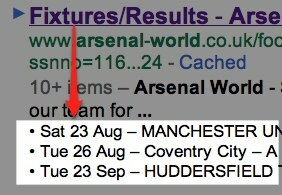 I have had several people asking about a new way of snippets they were seeing in Google result pages. Some thought this was some sort of testing by Google. It is not, it is a new feature which was rolled out last week: snippets for list pages. When pages consists mostly out of lists Google has found a way to show (part) of these lists in the snippet. This means that if you have a list on your page, that list might just be part of the snippets. Opportunity knocking! “This week we started rolling out snippet improvements for pages that contain lists; results for these pages will now reflect the structure of the page, rather than just showing two lines of text. We will try and look more into depth into how you can make them as perfect as possible and get back to you on this. The changes will be rolled out in the coming week so you might be seeing more of these. Why you should keep your robots.txt clean! The only downside to this is that the meta description gets truncated. This requires to work with shorter meta descriptions for pages with listings, just like you should be doing after Google introduced the new Sitelinks, where a limited amount of characters will be shown for the meta description. Point is that I’m quite happy with this new opportunity to get more attention, but I’m less happy with the limit space I have for displaying Unique Selling Point (USP’s) in the meta description. This will be going from +- 155 visible characters to +- 58. But in the end this will just require some more creativity. Surely it gives you extra incentive to update your meta descriptions and get to the point. Meta descriptions are also always one of the last things on the priority list. e.g. Arsenal World – 2010/2011 official fixture list – All fixtures and kick off times are subject to change. As long as you get everything b4 the second hyphen you have done your job! Pingback: Google Comes Out with New Snippet Format | Internet Marketing Inc.